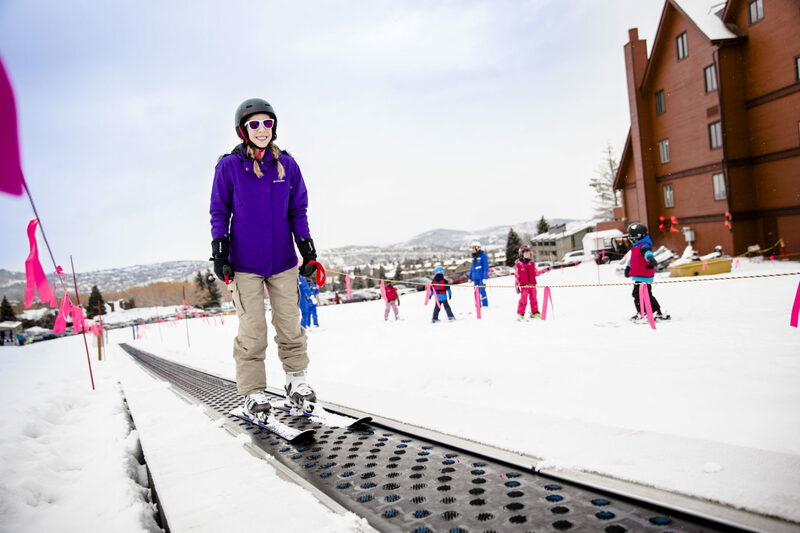 Park City skiing offers something for everyone — even complete newbies. 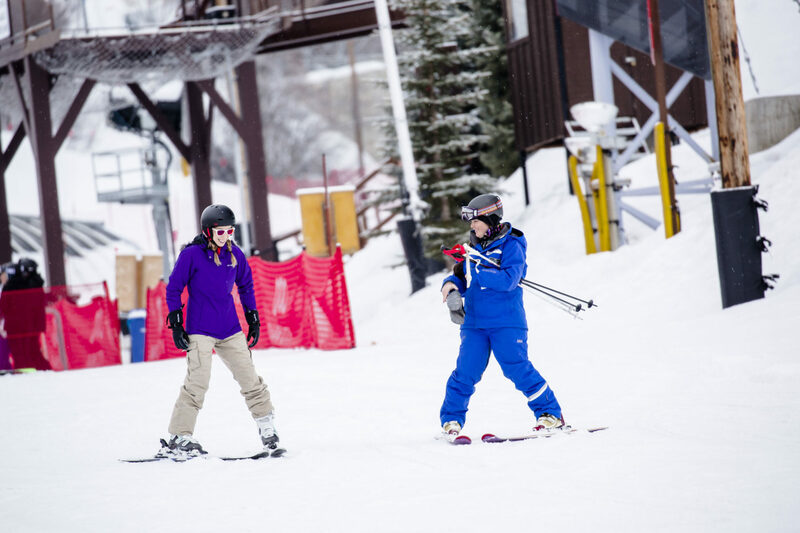 Here’s how I learned the ropes on the slopes during a ski lesson at Park City Mountain Resort. It’s all I could think as I stood outside of Marriott’s MountainSide in Park City, Utah, watching skiers zip down a steep, snowy incline. 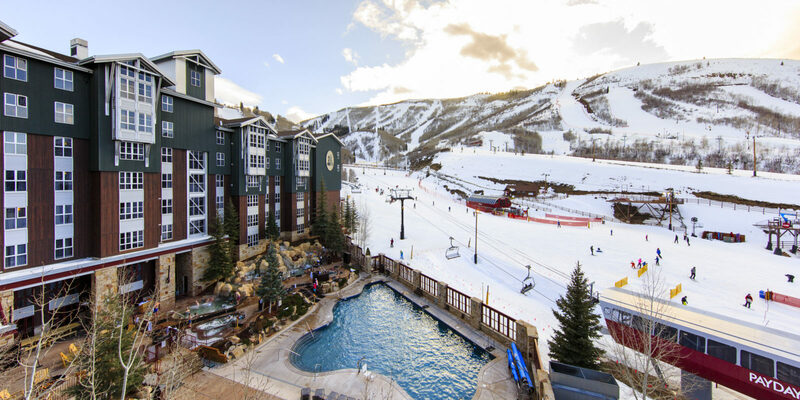 Drinking coffee and hovering around the warmth of the fire pit, I had a scenic view of the Park City Mountain Resort gondola shuttling groups of crazy people to the summit. Standing there a few steps from the slopes was the closest I’d ever gotten to skiing. As a certified member of the “make everything more awkward than it needs to be” club, with a badge in “needs to try new things a hundred times before getting the hang of it,” I’ve always considered skiing to be mysterious, uncomfortable and slightly scary. You want me to strap planks on my feet and barrel down a mountain? Are you kidding me?! But if there’s anything I’m even better at than being clumsy, it’s pushing myself out of my comfort zone. So while I was in Park City, I decided to sign up for a ski lesson — all the while crossing my fingers that I wouldn’t be spending three straight hours face-planting in the snow. 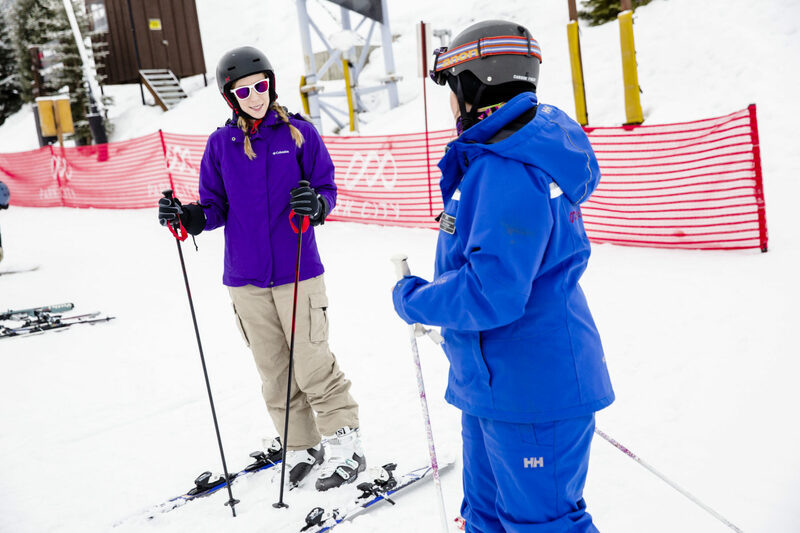 Enter Amy W., ski instructor at Park City Mountain Resort and quasi-miracle-worker. On a snowy, cold morning, I met Amy on the slope next to the resort. “Just so you know, I’m a huge klutz,” I blurted out by means of introduction. Seemingly unfazed, Amy gave me the patient, encouraging smile she probably reserves for five-year-old children. She told me later that feeling a bit of trepidation is normal. With her obvious love for the sport and considerable teaching skill, she was exactly the kind of person – and maybe the only kind of person – who could help me embrace my inner skier. Amy began by telling me that the goal of the first lesson was simply to be able to stop while wearing skis. Then she proceeded to teach me how to put my skis on, how to hold my weight, how to fall and how to balance on skis without the poles (otherwise you may be tempted to use them to stop). Slowly I scooted down the bunny hill, keeping the skis parallel to move forward (“French fry”) and creating a wedge to stop (“pizza”). Surprisingly, I managed to avoid falling flat on my face (“pancake”). Meanwhile, little tykes in possession of fearless energy and lower centers of gravity zoomed past me like pinballs. At the bottom of the slope, we all lined up to get on the “magic carpet” conveyor belt and I felt like a field trip chaperone in a long line of munchkins. As I continued the cycle, I was invigorated by the cold mountain air amid the snow-covered mountains — and started to figure out why people love skiing so much. After two hours, it was time to test my skills on the ski run. When Amy and I stepped off the lift, swarms of skiers were flying by from all directions — but I gamely began puttering down the slope with my slow, sliding wedge, trying not to get in anyone’s way. As I approached the end of the ski run, the terrain sloped up gently and Amy encouraged me to go faster so I could get over the rise. At that moment, my composure disappeared in the wind. When I tried to ski faster and lost my balance, I promptly forgot what I’d learned. Instead, I crashed backward in the least graceful way possible, possibly resembling an octopus flopping around on dry land as I tried to set myself upright. During my second attempt at the ski run, I once again fell in the exact same place – but this time, at least, I managed to collapse using proper form: I lost control of my turns and nearly skied in a complete circle before I decided to abandon ship and dive sideways into the welcoming snow. Still, I considered it a minor victory that I only fell twice in three hours. Over a celebratory hot cocoa with Amy, I found out that helping people conquer their fears and hit the slopes is one of her favorite parts of the job. And while I wouldn’t say I’ve fallen in love with skiing just yet, I’d be happy to take another lesson in the future. Aside from the fact that it’s a nice way to enjoy the winter scenery, I realized that getting out there and traversing a snowy peak (and sometimes tripping on it) made me feel more free, alive and in touch with nature. *Of course, as with many sports, there is a risk of injury with skiing. To help avoid injury, I made sure to take adequate precautions and use the recommended safety equipment. 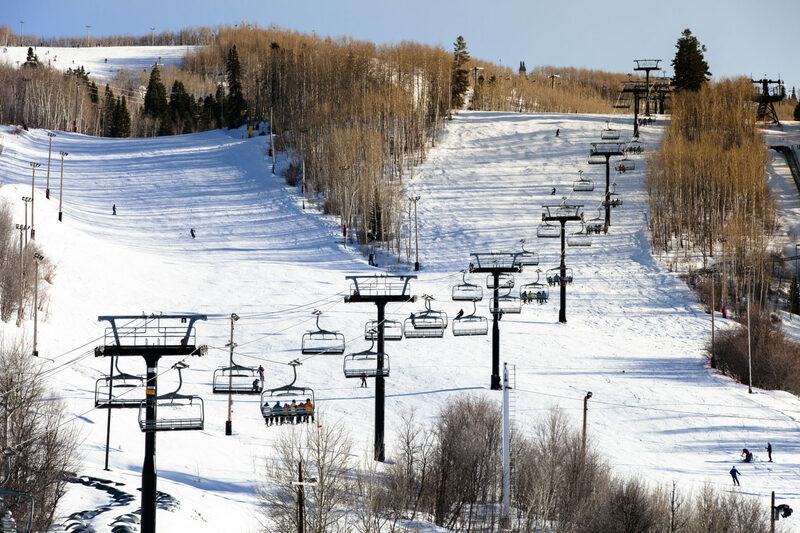 If you enjoyed this article, check out our posts on High West Saloon and Park City for Non-Skiers.